Nope, I am not talking about that kind of high! I am proud to say I have never experimented with drugs of any kind, heck I’ve never even smoked a cigarette. I am talking however talking about the kind of high you get during / after a run. Commonly known as ‘Runner’s High’ this is something I experienced a lot when I began running two years ago, but now this euphoric feeling washes over me only on rare occasions. Tonight was one of those occasions. 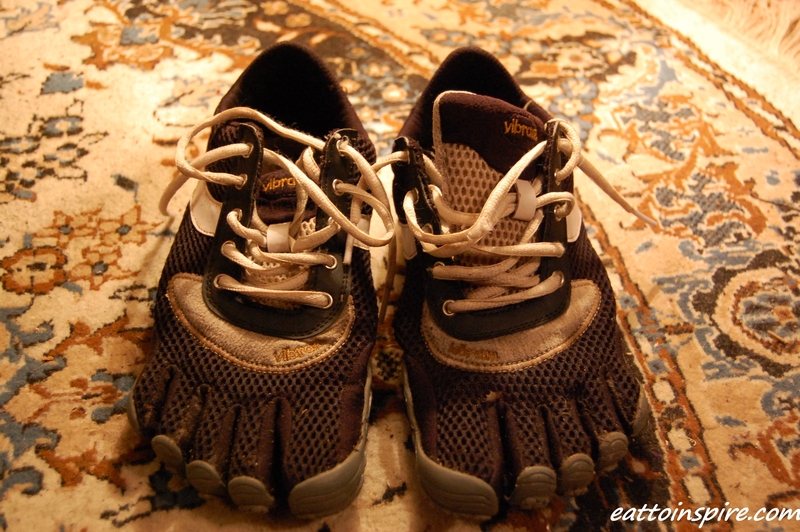 I have been transitioning VERY slowly to wearing Vibram Five Fingers this year. The most I have run in them to date is still only five miles. I am stoked with this though as a year ago I would pound the pavements in Nike’s and I always would have some kind of niggling pain here or there. Most notably was ankle pain and knee pain which at times was excruciating. So though I run MUCH shorter runs than I used to (at the moment) I see this as a huge accomplishment. If I had continued to punish my legs the way I was, whilst wearing the platform shoes that masquerade themselves as running shoes I think I would have had to hang up my shoes for good. 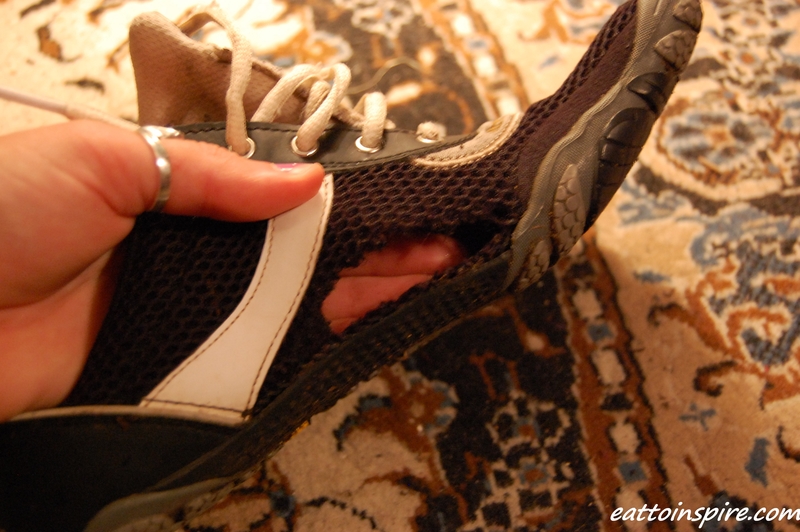 Do you think I need some new Vibrams?! Tonight’s run felt amazing. I set out for a quick run around my favourite route – 2.8 miles through the woodland near my house which is the most beautiful place to run. Yesterday the whole forest was shrouded in a low lying fog and it just looked epic, like, they could literally have filmed Twilight scenes there! Back to tonight, so I just felt pumped to run from the get go, all of my fave uplifting running songs came on my ipod and I just felt light and swift on my feet. I could tell that my form was good as my run just felt effortless, like they used to in the old days! I gave a warm smile to everybody I passed and had a high return rate, which always makes me happy 🙂 I got my kicks for the day. I felt like I was running for the sheer joy of it, I felt free and amazing. I love how a quick run can have such a huge impact on the way you feel in your head. Before a run I can look at my body in the mirror and my thought is usually, ‘you look ok,’ or ‘you look good.’ Post run, I can look back in the same mirror, at my body that looks EXACTLY THE SAME except I’m a bit sweaty and you want to know what I am thinking in my head?? WOW, WHAT A MAJESTIC BEAUTIFUL BEAST. If you’ve never been for a run before, you should give it a go. I promise you won’t regret it. Everybody has to start somewhere. I used to be scared to run because I always pictured in my head that I looked like a sweaty bumbling mess for people to make fun of. I imagined people would point and laugh. I have come to realise however, that this is most definitely not the case. Do you ever look at anybody running and think it is weird or funny? No! 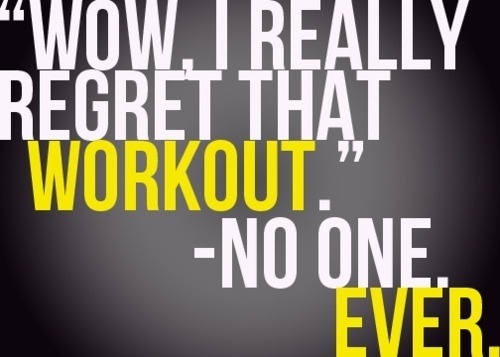 Other people don’t either, they just wish they were the one that had the balls to get up off the couch and get a sweat on. I have nothing but admiration for other runners, and I smile at you all when I see you because I feel like we both know the same secret and that knowing feeling is really rad. It never ceases to amaze me what a big change running can make to your head. I just stumbled across your blog and really enjoyed this entry. I just started running a week ago and it’s going to be tough to get used to. I’ve been a cyclist for many years, but never had any interest in running. At 41 years old I figured I should stop putting it off. Besides, I’ve been vegan for 19 years, so I’m in better shape than a lot of folks my age. Thanks for the inspiration! I am sure you will get into your running groove in no time 😀 I think it is important to just run for fun at first, don’t worry about your distance or speed, just concentrate on putting one foot in front of the other and seeing the world in a new way. If you want more inspiration, there are lots of books about running but ‘Born to Run’ is the best in my opinion, I would highly recommend it! Good luck let me know how it goes! !